Looking for a fresh fundraising idea your school families can get behind? Then say cheese! 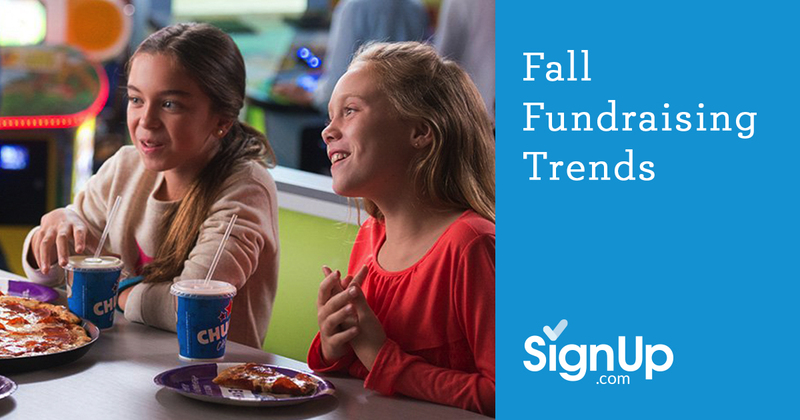 We’ve got quick snapshots on fundraising trends that are super hot for fall! Check them out . . .
2. Goods and Services for Cash: Sometimes the tried and true approach still gets the job done. There’s a reason bake sales and car washes have never gone away; people love to pay for goods and services that benefit a good cause, especially if the kids themselves have a hand in pulling them off. Think about having kids and their parents design gift baskets and then auctioning them off, and/or hold a craft fair selling items made by students and their parents. 3. Online Fundraiser Collaboration: So many social media/collaborative platforms offer methods for schools to seamlessly organize fundraisers, making it easier than ever for parents to get involved. SignUp.com’s free online volunteer calendar and volunteer SignUp sheets are fully automating what used to take a full-time coordinator to organize. Easily accessible from computers and mobile devices 24/7, and with real-time eCalendar syncing and automated reminders, SignUp.com allows participants to stay informed and productive with a minimum of effort. Other platforms such as Google Drive, Trello, Slack and Dropbox allow organizers and participants to share documents, ideas and commentary, all without an endless paper trail! 4. The No-Hassle Fundraiser: Having a lot of fundraisers can result in some cause fatigue. There is a trend among schools now to have hassle-free fundraisers—either simply asking for the money needed, or capitalizing on habits that donors already have established. For example, the Chuck E Cheese’s fundraiser described above is based on the idea that most families eat pizza and most frequent Chuck E Cheese’s. By organizing an event around eating pizza at Chuck E. Cheese’s, schools can reap 15% of the proceeds of the night and parents can have a fun time with their families in a safe environment that is already familiar to them. Click here to start planning your Chuck E. Cheese's Fundraiser. Or, since everyone has to shop for groceries, why not affiliate your school with a rewards program at the local grocer? If the store has a rewards program card, have your participants designate your school as the beneficiary. It’s never been easier to raise money for schools. With just a little bit of ingenuity and out-of-the-box thinking, schools can raise the funding they need while focusing on community building and creating learning opportunities.